Watch the videos below or on the Facebook page. On August 5th, I hosted the first Facebook live broadcast from the A Helpful Tutor page. 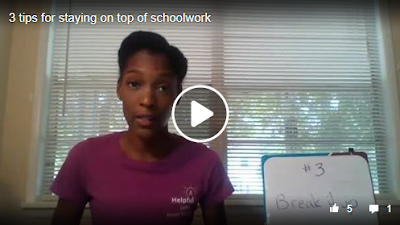 I shared three ways to make going back to school easier, pulling a few ideas from my Back to School Parenting Tips video series. I got some great feedback from that video and decided to do another the following week to help with staying on top of schoolwork as the year progresses. You can view both of those videos in this post or on Facebook. I’ll be sharing more through Facebook live this coming year, so like the page to be notified of upcoming videos. Thandiwe Ogbonna is a professional tutor with a sincere passion for learning. She strives to help her students reach their full potential in a supportive and encouraging environment.